First of all let me say, I don’t drink wine. I don’t drink alcohol. However, I do love grape juice. On assignment, I was staying in a bed and breakfast in Marcy en Beaujolias, a tiny village in French wine country, not far from Lyon, France. Not wanting to miss out on seeing the country side, I went for a walk early one morning. I only had an hour before I had to leave, so, as usual, I was in a hurry. The morning was beautiful. The late September sun was casting long morning shadows on stone walls and stone balconies built in the twelfth century. I was transported in time. 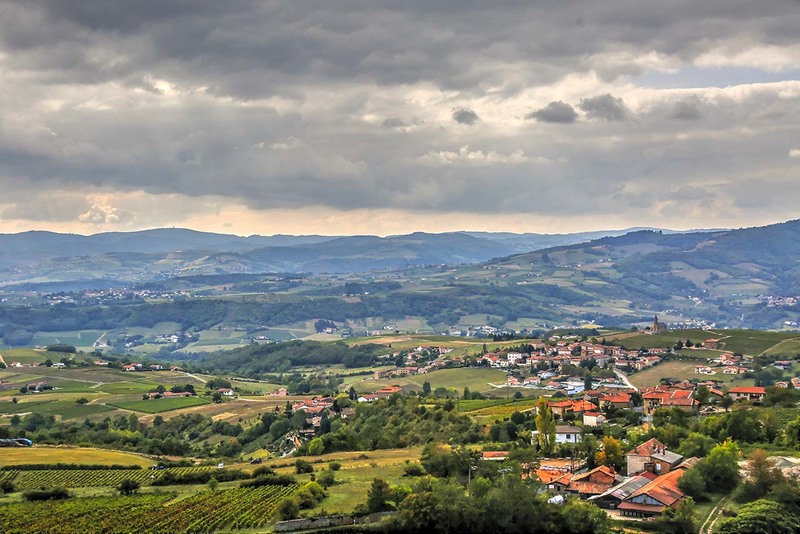 As I walked, I quickly ran out of village and found myself in the midst of a gorgeous, hilly vineyard countryside. The grape harvest was in progress. 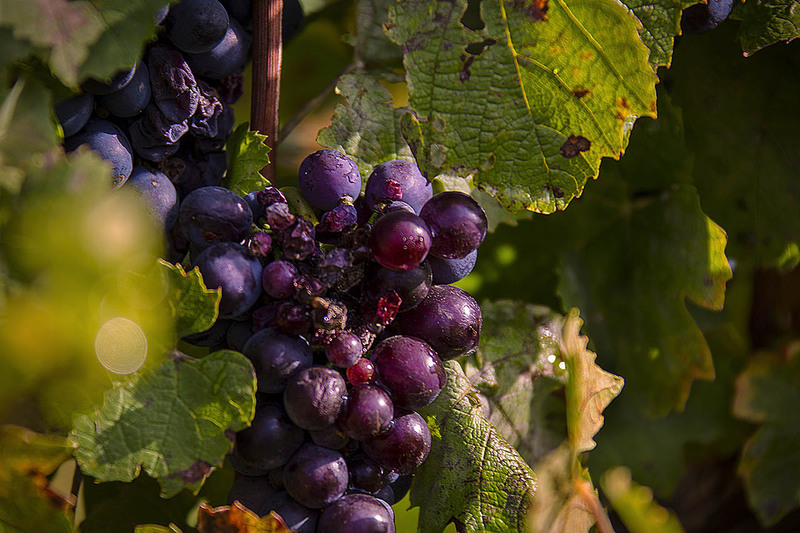 The vines were heavy with rich, red grapes, dripping with morning dew. Some of the leaves on the vines were changing from brilliant green to autumn red, indicating the close of another season. An old man, carrying a bucket hand picked and tested the grapes, while a modern, somewhat out of place, harvester, striped the rows of luscious fruit. On the harvester, another man sorted grapes and plucked the leaves from the harvest, in preparation for processing. The scene was magical, beautiful. I lost track of time as I walked a narrow lane through the vineyard. As I walked, a truck filled with grapes pulled up next to me. 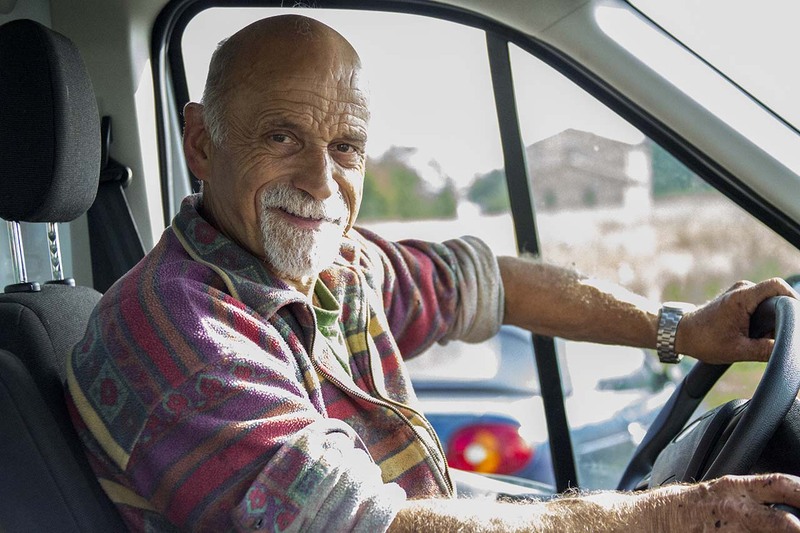 An old man beckoned me to “come, come.” I approached him and he motioned for me to get in the truck. He spoke as much English as I spoke French, next to nothing. The old man’s face was lined with wrinkles, leathered over the course of many seasons in the sun. His hair was gray. His beard was gray. His eyes twinkled. I climbed in the truck. He smiled as we drove through the vineyard. He would point to things as he talked. I enjoyed the view and the lilting sound of his voice, but I had no idea what he was saying. After about fifteen minutes, he backed into an ancient stone building. We got out of the truck as the old man pointed out important parts of his winery, talking non-stop. Another man, younger, shorter, but just as weathered, joined us with a smile. The younger man held a pitchfork in his hands. 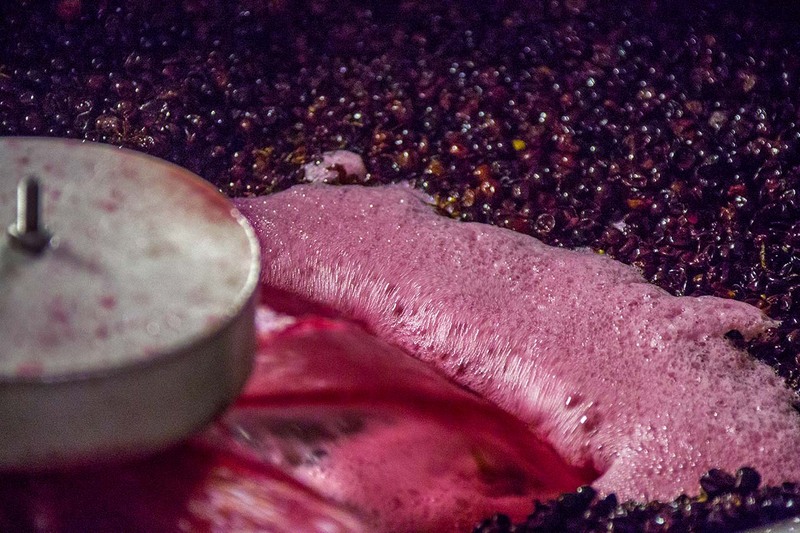 They pressed a lever and the bed of the truck rose, dumping grapes and juice into a vat below the truck. 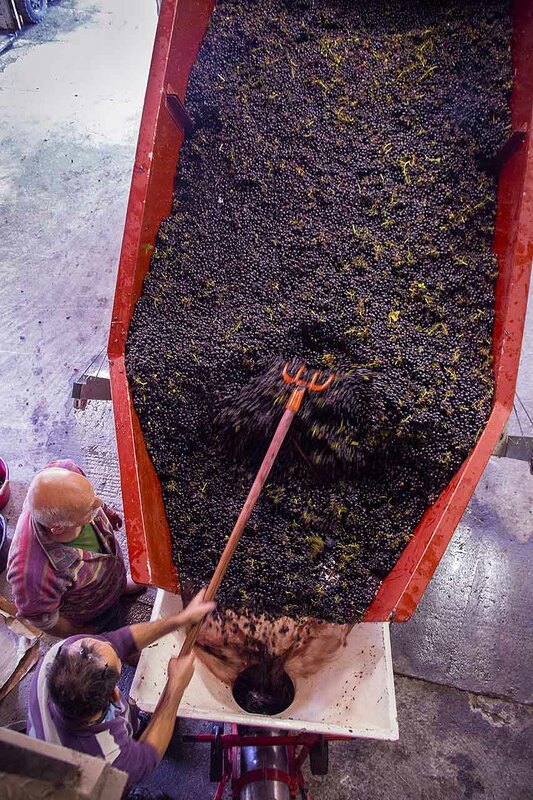 As the younger man forked the grapes from the truck the older man pointed out a large vat with a spinning mixer, turning and mashing grapes. The rich fragrance of grape juice was intoxicating. I could tastes the juice in the air it was so think and delicious. As I took pictures, the old man motioned me to follow. We went down a stone staircase into darkness. He flipped a switch and I was surrounded by gigantic wooden wine barrels. I think he was telling me that this was where they aged the wine. We went further underground into a wine cellar with an arched stone roof. Here, he showcased the Beaujolais wine he was so proud of. After looking around, he led me back up the stone steps into the light. The truck was empty, time for another load. We got back in the truck and he drove me back to the village. Before I left the truck, I asked his name. “Pierre”, he said, “Peter, in English.” We shook hands and I climbed out of the truck. Pierre drove away with a smile. I stood there, basking in the morning sun amidst the fragrant vineyard of a magical valley deep in the heart of France. I marveled at the unexpected adventure I had just experienced. 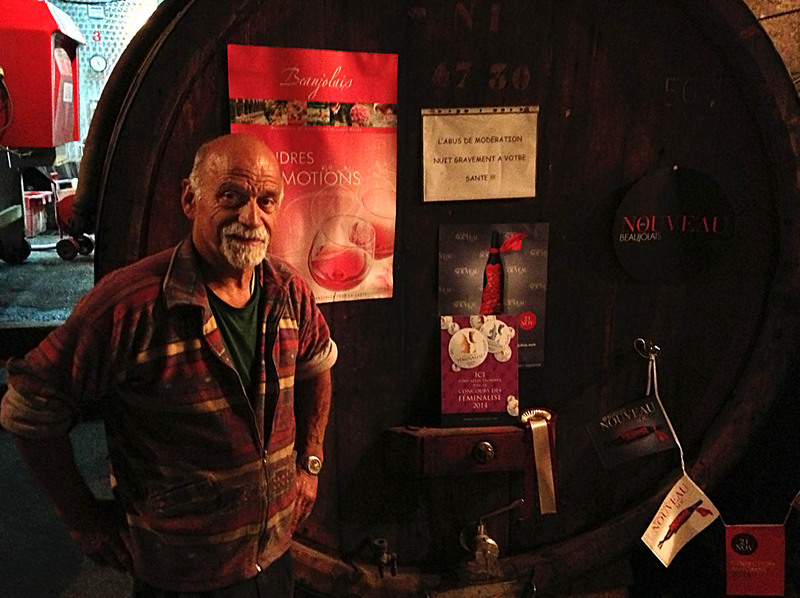 Pierre, like his father before him, and his father’s father’s father before them, has been making wine his entire life. On this day, perhaps unremarkable for him, yet most remarkable for me, Pierre offered a magical glimpse into a tradition that crossed the ages, jumped the stone fences and bridged our cultures through kindness. I will not forget his friendship. So, if you happen to be in Marcy en Beaujolais on a sunny morning during grape harvest season, be sure to take a walk through the vineyards. Look for a gray-haired man with a twinkle in his eye. While I don’t drink wine, I can, wholeheartedly recommend the grape juice. And, I can say from first-hand experience, there is still magic in the world and kindness without fear. Overlooking the vineyard, an ancient watchtower still stands guard. Ancient stones still provide homes for the villagers. Some walls are so old, the vines are escaping. Window frames set in ancient stone walls. Broken glass and aged wood can not compete with the age of stone. Colorful flowers adorn the village of Marcy. Flowers and colors are part of the beauty of Marcy. Flower boxes are part of village homes. Harvesters have modernized the grape harvest. Grape vines nearly two-hundred years old still produce abundantly. Wooden stakes help to hold up the vines as the fruit gets heavy. Autumn vines wait for harvest. Grape vine leaves begin to change colors at the end of the season. Ripe green grapes wait to be picked. Red grapes drip with morning dew. Modern harvesters have changed the ancient methods of harvesting. The Lord of the vineyard still picks the grapes by hand. 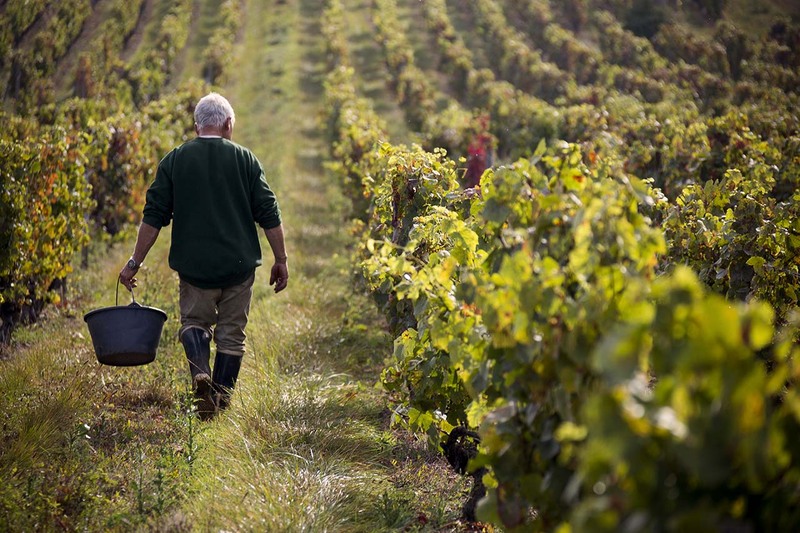 The vineyard master will walk the vineyard to judge the harvest. A bucket of ripe grapes weighs more than you think. An ancient castle turret still stand watch over the vineyard. Pierre sorts the grapes and removes leaves and twigs. 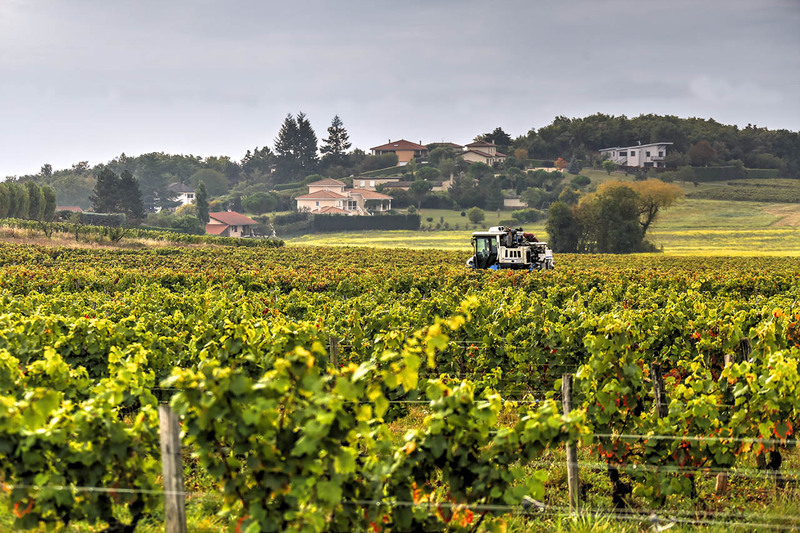 The harvester works late each day when the grapes are ripe. 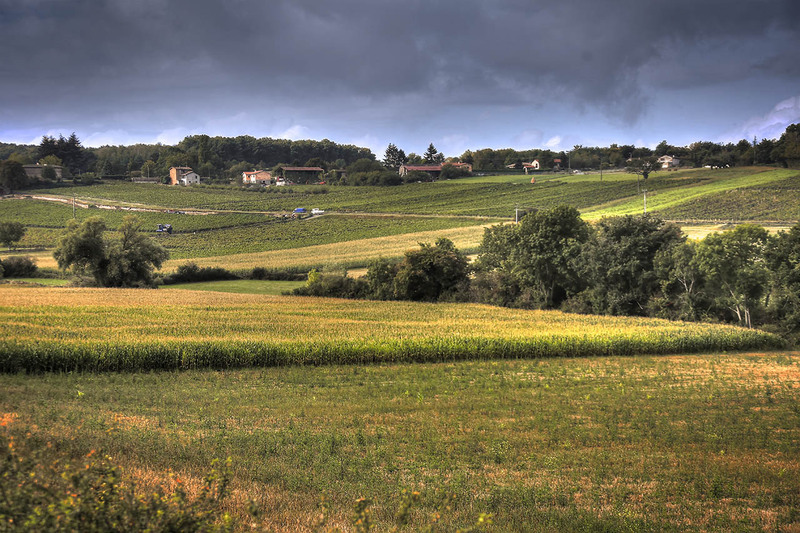 Rich land and beautiful countryside is part of the magic of wine country, France. An old stone building houses the wine harvest. Even the clothes pins are colorful in Marcy. Pierre and his associate rake the grapes from the harvest truck. The weight of the harvested grapes forces the juice from the back of the harvest truck. Machines squeeze the juice from fresh ripe grapes. As the machines squeeze the juice from the grapes the smell of fresh juice is intoxicating. Pierre is proud of his winery. 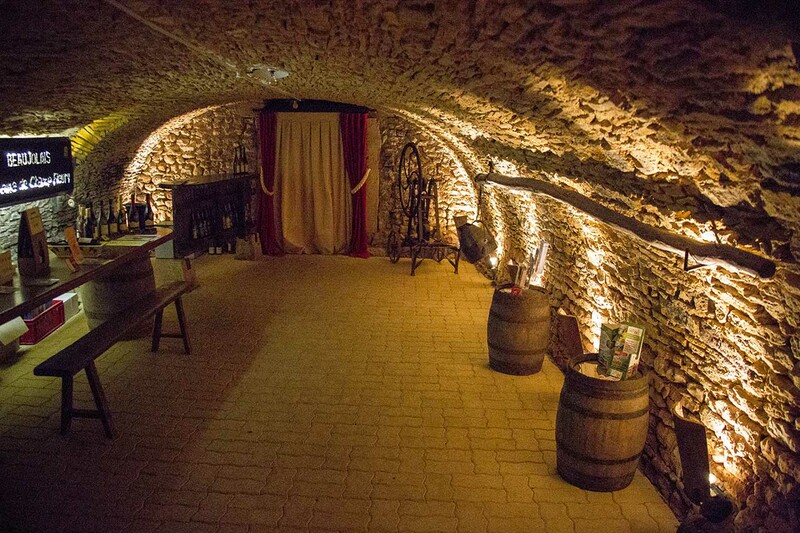 Underground cellars provide a constant temperature for aging wine. if you can find Marcy en Beaujolais, you can find anything. 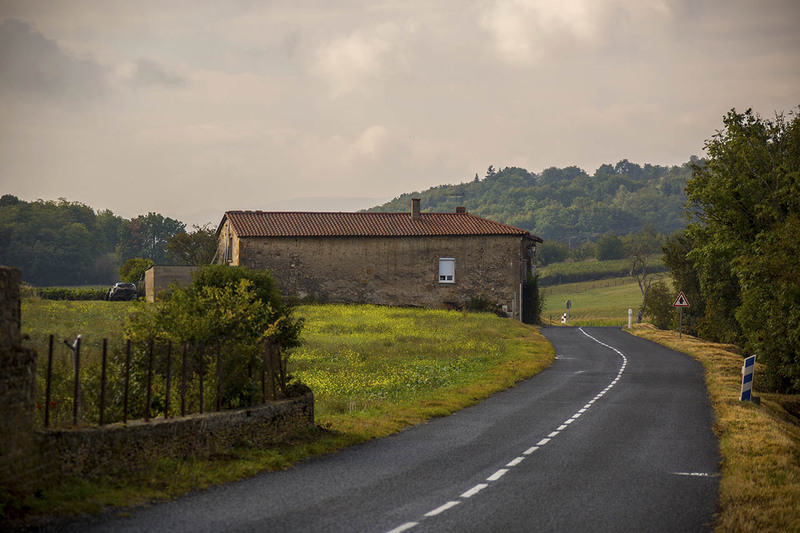 A bike ride through the country can be inviting. 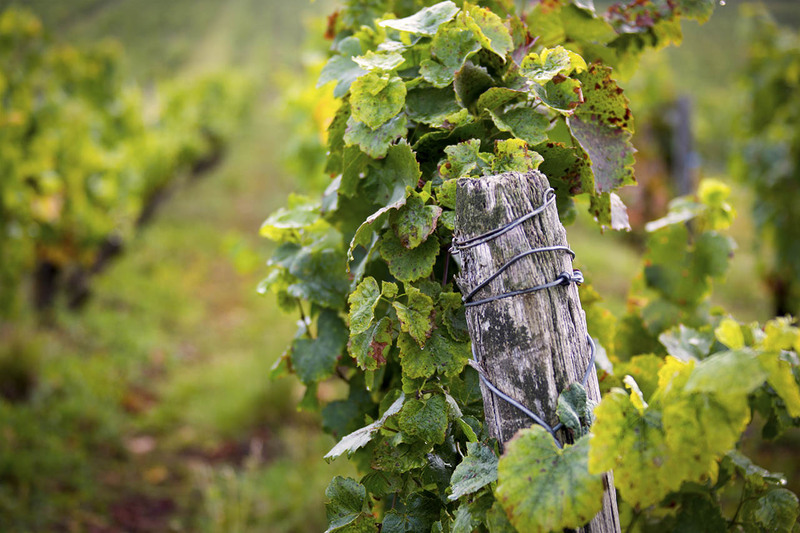 Some stone walls surrounding the vineyards are more than 700 years old. 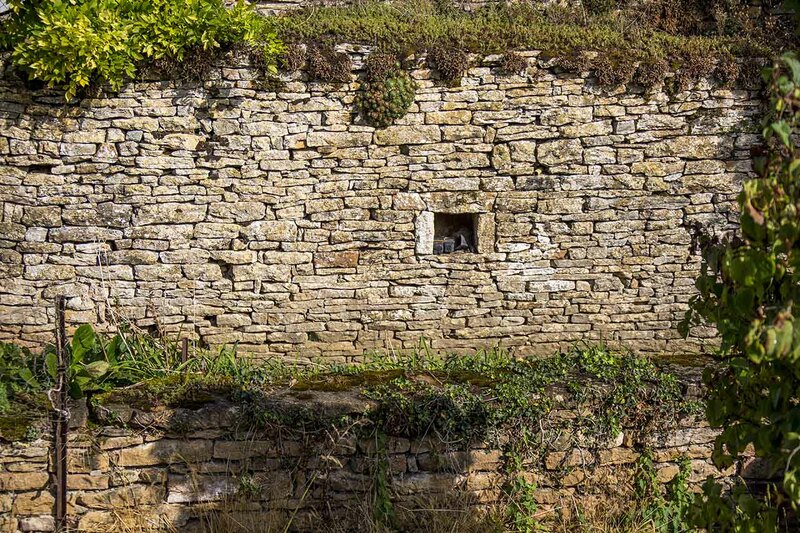 The condition of stone walls can be an indication of ancient age. In the middle ages, women came to this surviving community bath to wash clothes and to bathe. Built in the 12th century, the walls of this village still shelter residents. An old spigot provides water for gardening. A Master Gardener harvests fresh vegetables for our bed and breakfast. 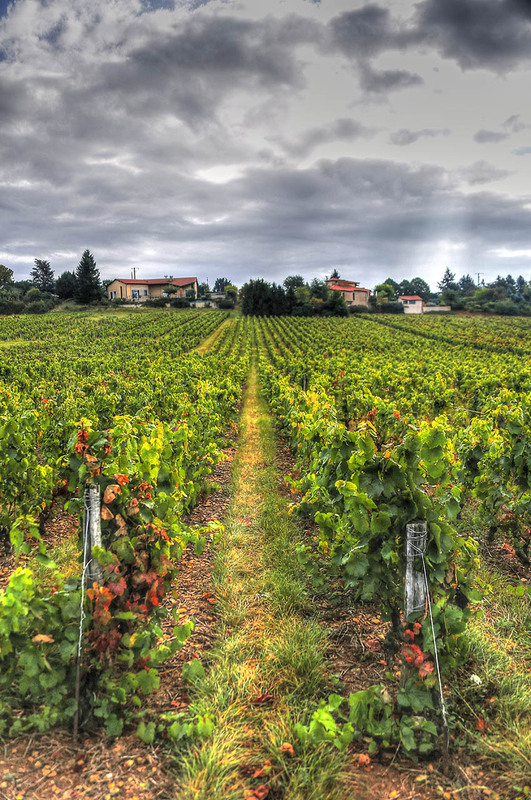 Red tile roofs and scenic vineyards dot the countryside of French wine country. The castle keep watches over the valley vineyard.